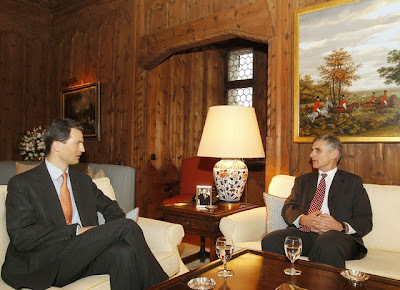 Today, Andreas Linhart, general secretary of the Federal Ministry for European and International Affairs of Austria, was on a visit to Liechtenstein and during the course of the day, he paid a visit to Schloss Vaduz where he was received by Hereditary Prince Alois. Another point on the Austrian guest's agenda was a political meeting being held at the Principality's Office for Foreign Affairs which was attended by Princess Maria-Pia, Liechtenstein's ambassador to Austria. Also check out our updated version of the post about the New Year's audiences which happened in Luxembourg today.